CHOMPER THE EXCAVATOR building playset! Includes boom arm and claw! Use the book mold to create pretend bricks. Claw grabs the bricks to build a wall! Smash with the claw when you want to start over! Includes 2 cans of PLAY-DOH modeling compound. Playset comes with boom arm and claw, hand tool, book mold and 2 cans of PLAY-DOH modeling compound…. Dig, build and smash with this construction playset that combines the building creativity of Play-Doh. With Chomper the Excavator playset, you can create pretend bricks and then use the boom arm and claw to pick up your bricks to build a wall. Then use the claw to smash it to pieces and build a new one. Build it, Bash it and start all over again. Includes: 2 cans of Play-Doh modeling compound; Includes with boom arm and claw; Hand tool; Book mould; Size H24.1, W30.8, D8.3cm; For ages 3 years and over; EAN: 5010994685447. WARNING(S): Not suitable for children under 3 years old. ADSI iextra delivery Part of our extended internet range. Not featured in our current catalogue. Can be ordered for home delivery via courier or reserved for in-store pick up (subject to stock). * . Dig, build and smash with this construction playset that combines the building creativity of Play-Doh and the hard-working fun of Chuck and Friends! The Chomper The Excavator playset lets you create pretend bricks, then use the boom arm and claw to pick up your bricks to build a wall. Then use the claw to smash it to pieces and build a new one! Build it, bash it, and start all over with your Chomper The Excavator playset! Playset comes with boom arm and claw, hand tool, book mold and 2 cans of Play-Doh modeling compound. This toy costs approximately £12.99 (for the latest and best prices make sure you check our retailer list for the Play-Doh Chomper the Excavator above). 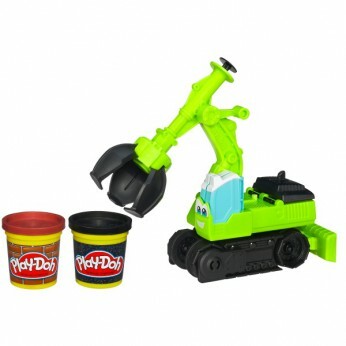 In our review of Play-Doh Chomper the Excavator we classed it as being suitable for ages 1 to 3 years, 3 years, 4 years, 5 years but recommend you check the manufacturer specific advice before purchasing.